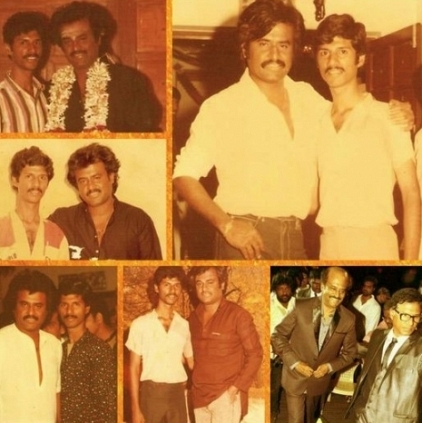 THE STORY OF HOW A RAJINIKANTH VERIYAN BECAME A RAJINIKANTH PRO! Riaz K Ahmed is a powerful name in film circuits. Starting as a film enthusiast and then identifying his indomitable love for Thalaivar Rajinikanth, this part time journalist grew into an artist manager and now is the PRO of celebrated artists and also the public relations officer of Superstar Rajinikanth. Known for his vast experience in the cine-field and also for the rapport with the press, Riaz is the automatic choice for upcoming actors who are testing waters in the industry. Today, the 11th of February being Riaz Ahmed's birthday, we spoke to him to know about his fanaticism for Rajini and how he eventually became his PRO. “I have always been a great lover of cinema. Even as a kid, I remember playing film based games only. I used to get film tapes and project it to people around. I started as an active participant in my Thalaivar's fan-camp. Rajini sir started to notice my goodwill and always knew me as his ardent fan. After a while, Thanu sir gave me the much needed break through the film Nallavan and later I became Disco Shanti's manager taking care of all her appointments and commitments. Also doing freelance journalism at that point of time, I learnt the functioning of the tinsel town and realized the potential of being a PRO. Riaz K Ahmed Will Be The Official Public Relations Officer (PRO) For Vijay. People looking for online information on Riaz K Ahmed, Superstar Rajinikanth will find this news story useful.